dermaplane, microdermabrasion, chemical peels, microneedling, LED light therapy, eyebrow threading, hydrafacial, micropigmentation, warts, moles, sebaceous hyperplaxia, acne, hyperpigmentation, wrinkles, anti-aging. What is the main purpose of a chemical peel? The answer is to create a “controlled” burn, which is a wound. The wound suffered by the skin triggers the healing process which is instrumental in creating new skin cells at a very rapid rate and also stimulating the synthesis of new collagen and elastin which is why we talk about fresh looking skin, softening of lines and wrinkles and tightening of skin after a peel. This is a small sample of the facial peels offered at Therapy World Medical Spa. After a chemical peel, you are advised not to expose your skin to the sun for at least a week and thereafter you need to use a professional SPF30 or above. We will not perform a peel if your immune system is comprised. Sometimes the three will overlap. However, not everyone is a candidate for a certain type of peel because of ethnicity, prescription & non-prescription drugs, life-style, dietary habits and existing health conditions. We are one of the few medical facilities that still perform the Obagi Blue Peel which is a Deep Peel for those who have extreme sun-damage, leading to deep lines and hyper-pigmentation. The Rhonda Allison chemical peels fall into different categories but have Superficial to Mid-Depth to Deep Peels and everything in between. The practitioner can very easily customize any peel to suit her/his client. Dr. Fulton’s 4-layered Peel is a great asset because one can completely customize the layers to suit the client’s needs and pain threshold. We do carry Chemical and Organic Peels from other manufacturers and are, therefore, able to perform about 150 different peels at our location. Cryotherapy to freeze pigmented lesions and warts etc. Cauterize skin tags, cherry hemangiomas, sebaceous hyperplaxia and more. Dermaplaning is an excellent method for achieving a more intense exfoliation. Dermaplaning involves using a medical blade at an angle to exfoliate the topical layer of dead cells called corneocytes. This is an advantageous protocol because it not only removes superficial dead skin allowing news cells to surface but also allows skin products to penetrate more effectively. The side benefit is that it removes unwanted hair, albeit, temporarily. It may cause some redness, especially in someone with sensitive skin, but this subsides in an hour or so. It is not recommended for active pustular acneic skin. Dermaplaning is a great option for those clients who are actively using aggressive topicals, example Retin-A, Retinols, Glycolic acid or high strength Salicylic acids on a home care routine. It not only accelerates and aids in the sloughing off of the dead skin but is a great alternative to waxing which could literally rip areas of the skin, particularly in cases of prolonged usage of exfoliating agents such as Retin-A. Microdermabrasion was developed in 1987 in Italy and was introduced to the USA in the mid 1990s. It is a great tool for aestheticians in performing mechanical exfoliation for cellular regeneration and lifting superficial hyper-pigmentation. The older machines have micro-crystals (aluminum oxide or sodium chloride) which abrades the superficial layers of the skin. Due to the controversy related to the inhaling of aluminum particles and the inefficiency of sodium chloride as an effective exfoliant, manufacturers introduced diamond and sapphire grit tips to eliminate those shortcomings. Therapy World uses crystal-free devices that utilize sapphire and diamond tips for exfoliation. The Sapphire 3 Microdermabrasion system is a crystal-free machine that has diamond and sapphire tips for different types of skin and body areas that need exfoliation. The results of this exfoliating service are absolutely incomparable to any microdermabrasion treatment that you might have had with any other system. This is followed by a Red LED with micro-current for lifting and collagen synthesis and finally the Blue LED for oxygenating skin which acts as an anti-bacterial and anti-aging support. LED Light Therapy is a completely safe, non-invasive, non-thermal service which uses Light Emitting Diodes (LEDs) to emit safe light that is absorbed by the skin, stimulating natural rejuvenation and resulting in glowing, radiant skin. A complex interaction of red, blue, amber and green light delivered through LEDs has been proven to dramatically increase cellular function, improve the skin turgor and elasticity, reduce acne breakouts and minimize the appearance of lines and wrinkles. Services are painless and all skin colors and conditions can benefit effectively. The number of services will vary depending on skin type, areas of concern, and objectives. A full series is recommended for comprehensive results. Micro-needling uses a precision engineered medical mechanical pen known as the DERMAPEN that has 12 titanium surgical micro-needles which stamps the top layers of the skin without damaging it. It stimulates collagen production to reduce upper lip wrinkles (smokers lines), minimizes deep facial lines, wrinkles, reduces hyper-pigmentation, diminishes the appearance of stretch marks and acne scarring. Micro-needling improves skin with very little down-time and very little discomfort. A consultation is required before this procedure will be performed. This is a non-invasive skin treatment that utilizes a pen-like tool with a cartridge of sphere shaped tips to create micro-channels in the skin, allowing active ingredients to be driven deep into the epidermis for optimal restoration. The active ingredients which are in the form of serums and boosts are customized to suit the needs of each individual client. The deep, almost burnt orange in this picture is the result of using a retinol ingredient for acneic skin to help diminish and eventually clear up acne. It is not blood related as there are no needles used to puncture the skin. For anti-aging or fine lines and hyperpigmentation, a set of different serums are used. 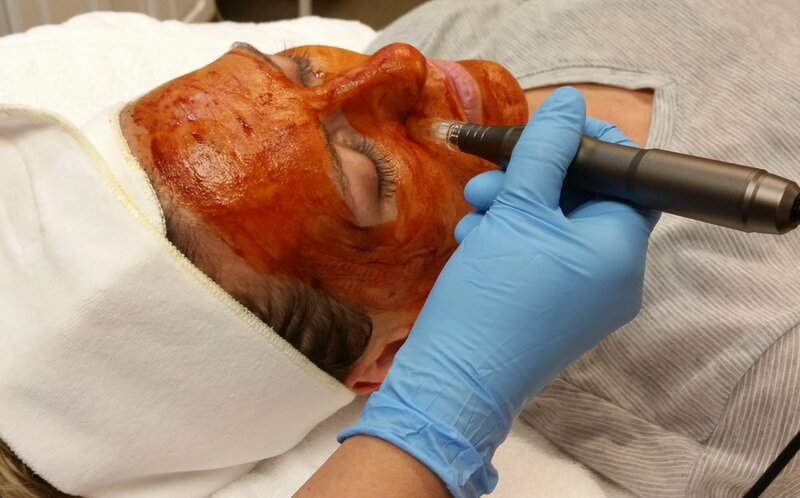 This service is a favorite with all clients who love the lighter, glowing and healthier skin after the procedure! A must for all to try at least once! Bio Infusion consists of exfoliation, product infusion and LED light therapy, all of which are provided in this new state-of-art treatment that can help with aging, acne and hyperpigmentation, but specifically targets dehydrated skin. After even one session, the client can see visual hydration and a healthy glow. It is a great complement to our corrective skin care services and can be performed instead of a facial for maintenance purposes.